Mother Nature must have known it was letter N week at Park Prep when she stirred up a Nor’easter which yielded some Not Nice weather! As a result, letter N week was unexpectedly cut short by two days, as school was Not in session. 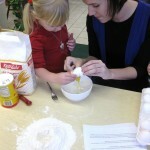 Continue reading below to find out about Letter N week’s activities. On Monday and Tuesday, the students worked on their letter N tracing and identification activity sheets. Some of the N words included: noodles, nests, nurses, noses, and more! Much to the surprise of the teachers, the students had quite an extensive vocabulary for noodles! 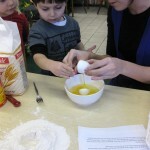 Spaghetti, pasta, macaroni, and ziti were just a few of the words students used to describe the pictures of noodles. After a little reminder as to what the letter of the week was, the students quickly shifted their answer to the umbrella term, noodle! 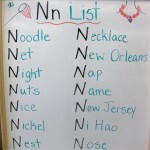 In the afternoon, the students used their noggins to create this N List. Speaking of confusion about the letter of the week, when the students returned to school on Friday after having Wednesday and Thursday off, many of them assumed it was Letter O week. The unforeseen days off in the middle of the week surely seemed like a weekend to the students. When it came time for morning meeting, many students were surprised to hear the word Friday in the message. Some of the students offered a helpful suggestion to inform the teachers of their mistake about the day of the week. It was only until they sang the “Days of the Week Song” and heard the order of the days that they realized it was actually Friday! Once the day of the week confusion had been sorted out and the theme of the week restored, the teachers informed the students of the treat that they were in for later on! With a little help from some basic ingredients, the school transformed into The Park Prep Homemade Noodle Factory! 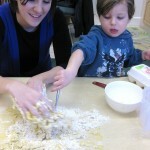 Working in small groups, the students followed the recipe below to create some neat noodles! 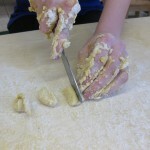 Here is a step-by-step guide to making homemade noodles, PPA-style! 1. Pile 2 cups of flour on a clean surface and make a well in the center to create a flour volcano. 2. Crack three eggs into a bowl and add 1/2 teaspoon of salt then beat lightly. 3. 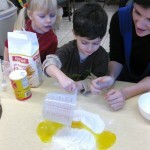 Pour egg mixture into the center of the volcano. 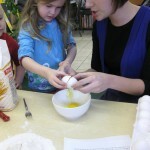 Use a fork (or your hands) to mix the egg into the flour. Gradually kneed in more flour until the dough is smooth. 4. 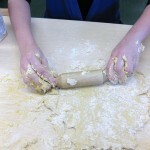 Use a rolling pin to roll out the dough into a very thin sheet. Sprinkle with some flour to keep it from sticking to the surface. 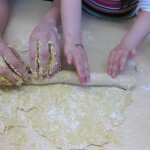 Then roll up the dough into one long tube. 5. Using a butter knife, slice the dough into half-inch increments. This will create small noodle pinwheels. 6. 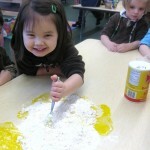 Gently unwind the pinwheels and lay the noodles flat onto a lightly floured surface – like below. 7. Let the noodles dry for 3-4 hours (or overnight). 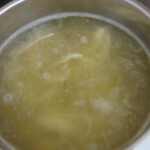 To cook the noodles, bring 8 cups of chicken broth to a boil. 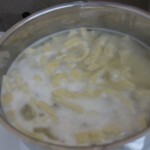 Shake excess flour from dried noodles and carefully add them to the boiling broth. Cook until noodles are soft and begin to float. 8. Serve with sauce, butter, cheese, etc. and ENJOY! Friday afternoon ended with music, a birthday party and a brief Valentine’s Day celebration! 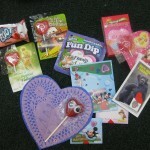 Here are some of the Valentines that were tucked into the students’ backpacks before heading home for the weekend. They were really SWEET! Well, that is all for Letter N Week. 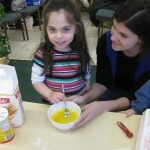 We hope you enjoyed this week’s blog entry. As always, thanks for reading and we’ll see you next week!